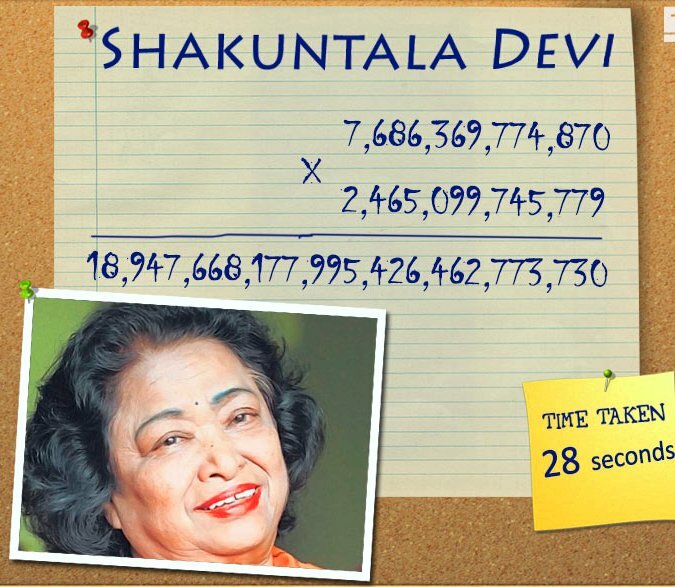 Mathematical genius Shakuntala Devi, nicknamed as “human computer”, was known for her ability to make complex mental calculations. She found a slot in the Guinness Book of World Record for her outstanding ability. Born in 1929 in a poor family in Bangalore, Shakuntala Devi dropped out of school because her father, a circus worker, could not afford the monthly school fee of Rs 2. She grew up in a slum and at a very young age, her mathematical abilities were recognized by her father. There is an interesting anecdote about how he recognized it. At the age of 3, when she started playing cards with her father, he was surprised to find that she was winning all the games against him everyday. Suspecting some foul play, he began his investigation during which he realized that she was memorizing all the card numbers and their sequence as the game progressed in the initial rounds and with her memory power, she was able to predict the sequence of cards in the subsequent rounds in the same game and thus wait to pick cards strategically to help her win. SHAKUNTLA DEVI's father taught her mathematical operations like multiplication, division & square root and took her to his circus to demonstrate her quick calculation abilities & memory power to the crowds. As the word about her skills spread, she started doing road shows as well across the city. At the age of 6, she gave her first major show at Mysore University and there was no turning back after that. On June 18, 1980, the Human computer, Shakuntala Devi demonstrated the multiplication of two 13-digit numbers 7,686,369,774,870 × 2,465,099,745,779 picked at random by the Computer Department of Imperial College, London. She answered 18,947,668,177,995,426,462,773,730 in 28 seconds. This event is mentioned in the Guinness Book of Records. Jensen wrote in his report that the calculation was done and answers given even before he wrote the answer in his notebook. The findings were published in the academic journal Intelligence in 1990. 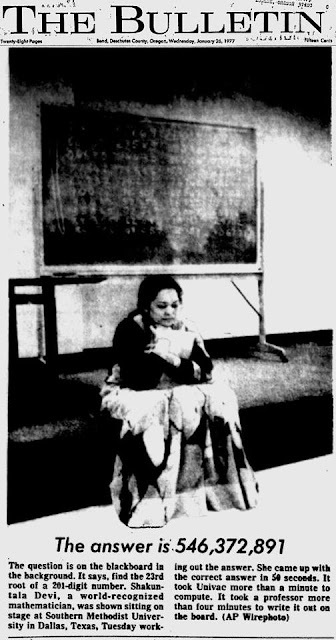 Shakuntala Devi won the 'Distinguished Woman of the Year Award' in 1969, from the University of Philippines along with a gold medal. In 1988, she was honored with the 'Ramanujan Mathematical Genius Award' in Washington D.C., conferred to her by the-then Indian Ambassador to US. Her name was listed in the '1995 Guinness Book of World Records' edition for her outstanding mathematical feat where she beat the world's fastest computer at multiplying two thirteen digit numbers. A month before her death, she was honored with the 'Lifetime Achievement Award' in Mumbai, in 2013. In April 2013, Shakuntala Devi passed away in a hospital in Bangalore from complications of the heart and kidneys at the age of 83. Devi wrote a number of books with titles like Fun with Numbers and Puzzles to Puzzle You.